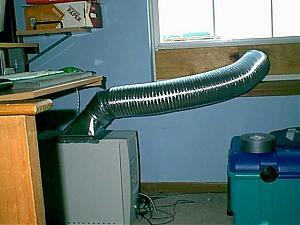 I decided that I wanted to get that cold WI air into my computer case so I came up with this idea. I don't have the window fitting and tube done yet but that's coming. There's a 120mm fan inside the computer duct. Edit: That's with full load. 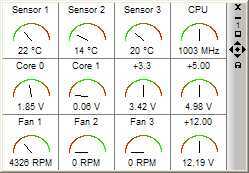 My fan intake is currently at 11C and my room temp is 22C. My case temp has now went down to 13C. Last edited by Superman; 25th November, 2001 at 05:50 AM. Last winter I left my radiator out the window for a while, but eventually it caused some minor condensation issues(cold waterblock, warm chassis), so I had to bring it back indoors. 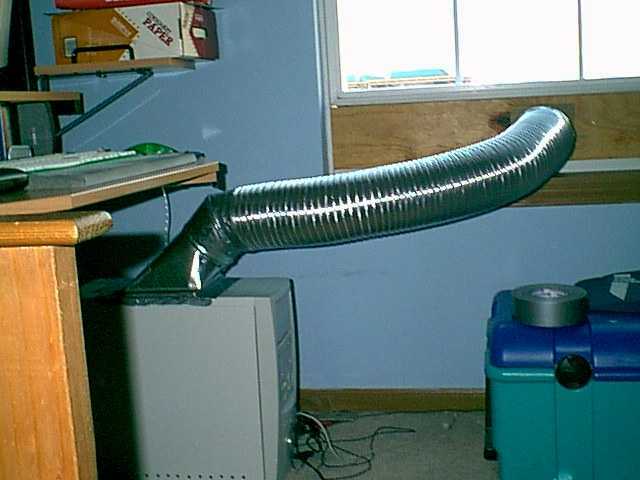 One of these days I want to get around to installing an subterranean heat exchanger, to let the ~55F earth keep my PC cool. It's 12:30 a l'apres-midi here and my CPU temps are 4C cooler than room temp. I'm in my room in a t-shirt while the case temp is 11C and the CPU is 17C. This is awesome. I can't wait until tonight to see the temps. At the fan intake I do. And I bent the thing a bit so that rain isn't a problem. It never rains from the south anyway, always from the West or North. I keep thinking to do the same thing, although my idea was just to bury a long copper coil about 3 feet below the surface. In and out through the basement wall. Pump/reservoir downstairs with tubing coming up through the floor to feed the block. Just don't know if I have it in me to do that. BTW Superman. Love those temps. Ploaf I see your point do you know how to calculate the length of tube that may be needed to drop the temp of the water running through it. Off hand? No. I am more into guess work, trial and error, screwing up until I get it right, although I would think that 20-30' of copper tubing would be enough to do the job. If you had a slightly larger reservoir then it would be easy enough. If you really want to consider these things also consider the makeup of the soil as some soil types may more readily take the heat than other types. Clay would pack nicely around the tubing assuming that you added water when burying everything and made sure it was packed tight. A nice loamy soil would pack tight around it as well. Sand on the other hand may not work as well. But then all of these could be completely reversed and sand may work better. I don't know since I have never studied the thermal conductivity of soils. One thing I know. Once you do it you're not going to do dig it back up. Best case scenario there would be that you had a lot of work involved. Average case scenario would be mangled tubing. I also want to try to cool all of my machines with water, but with one single pressurized system with trunk and feeder lines using well pump equipment, 3/4" trunk lines with 1/2'-3/8' feeder lines and a 20-30 gallon reservoir with check valves/pressure tank/pressure regulator and sensor, and a pressure tank to help maintain solid pressure throughout the system without having the pump run constantly. The well pump may be a bit much though. Uh, oh. I left my thing in the window this evening and when I came back from a party the aluminium pipe had a bit of ice on the exterior of it. Case and everything else was OK. Is this bad? I think I would be a little worried about the moisture content of the outside air also. (humidity) I have played with the idea you have in practice there and here in the south it would not work well as the humidity always seems to run high. Winter & Summer. 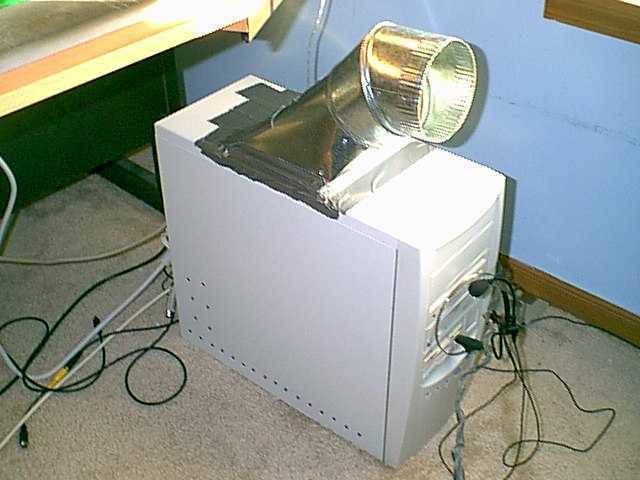 My other idea is to use something like that to duct the heat from the PSU and out fan on the back to get it out of the room so the temps will stay low and not be warmed by it's own exhaust. Subterranean idea is interesting. Any idea what the cost of the copper tube would be. I imagine high.